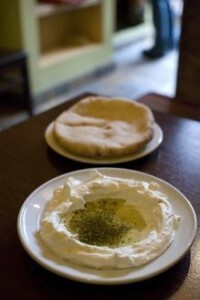 I remember breakfasts of Labneh, Zaatar, mint, tomato and cucumber with fresh, paper thin markouk bread. 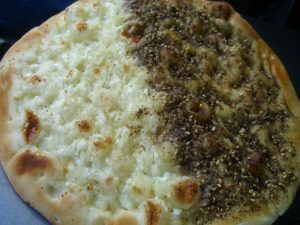 On weekends, when time was a luxury we could afford, it would be kishk and qawarma hiding full cloves of garlic in creamy whiteness speckled with shallow fried pine nuts. We burnt our tongues in impatience and never learned to wait. Eggs with sumac were fluffy and crunchy, slowly fried with olive oil in pottery and devoured within seconds with farm fresh home made goat’s milk yoghurt. Every once in a while, mom would send dad down to the baker’s with a variety of containers to be made into Lebanese pizzas and pies. 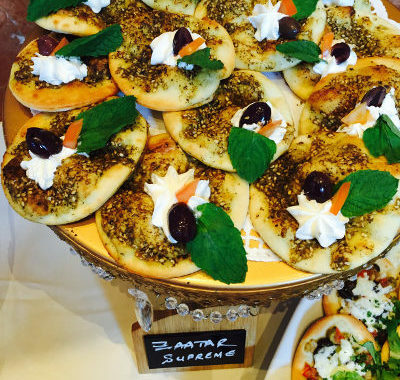 The one for manakish would be full of her special zaatar mix – hand picked mountain thyme, dried and mixed with freshly roasted sesame seeds, sumac and of course, olive oil from our decades old olive grove. Another would have spinach and wild silver beet mixed with onions and used to fill the triangular Fattayer b’Sbenekh w Selek. Then there was Lahm b’Ajeen, mutton and beef mince mixed with onions, tomatoes, pine nuts, pomegranate molasses and spices served piping hot on top of the crispy golden brown pastry. A squeeze of lemon juice was all it needed to become the perfect meat pie. Let’s not get into an argument here. Dad would drive on missions in search of the freshest produce. On his way back home, he would beep the horn, sending a special message that got us on to our feet and out to greet him. The three boys would help dad carry boxes full of the freshest produce upstairs where mom would complain. On a good day. electricity was only available for two or three hours if we were lucky, and that meant that produce needed to be bought and consumed very quickly. But Dad had a problem. Buying a kilo or less of anything was a strange concept he never embraced; and so mom got busy cooking three or four meals at a time, preserving what she could and handing out the rest to the neighbours, who were all too keen to repay the favour and offload their own husbands’ overzealous shopping habits, undermining mom’s evacuation efforts.